The Middle Fork Flathead is a pristine, scenic run originating in the North end of the Great Bear Wilderness. It's generally done as either a two or three day trip. No permits are required, but the complicated and expensive logistics are enough to keep usage minimal. Technically, group size is limited to 10, but more than two or three paddlers isn't really practical, given the fly in shuttle. The Middle Fork is my favorite solo run in late season. The whitewater on the Middle Fork consists of two main series of rapids. The first is the Three Forks Series, which is a long, technical class III-IV section, with some interesting moves against a headwall towards the end. It's near the upper end of the run, where the river starts to gorge up for the first time. At low flows its fairly straight foward read and run, though there are a couple of spots that could become sketchy at high flows. The second major whitewater section, located near the end of the run, is Spruce Park. Here the river drops into a vertically walled inner canyon, that contains several tight drops in succession. Montana Surf rates Spruce Park as a class IV+ at high flows. At all levels its a solid and technical class IV. I've heard horror stories of portaging rafts through Spruce Park at low water, when its only runnable in kayaks. There are several indistinct sections of whitewater scatttered throughout the run, and there are several places that collect bad wood. Be on the look out for blocked channels with terminal log jams in all drops. This is a very woody river. I have never seen a Grizzly Bear on the Middle Fork, but I have reliable reports of scary encounters. Practice extreme bear safety, including hanging your food far from your camp in a bear safe manner. Bear spray is highly recommended. Also, please practice extreme low impact camping in general. This run has an exceptionally pristine nature compared to other popular Wilderness runs, so do your best to keep it that way. Harvest only downed wood for your fire, and don't take any at all in higher use areas. Wilderness camping regulations are in place. 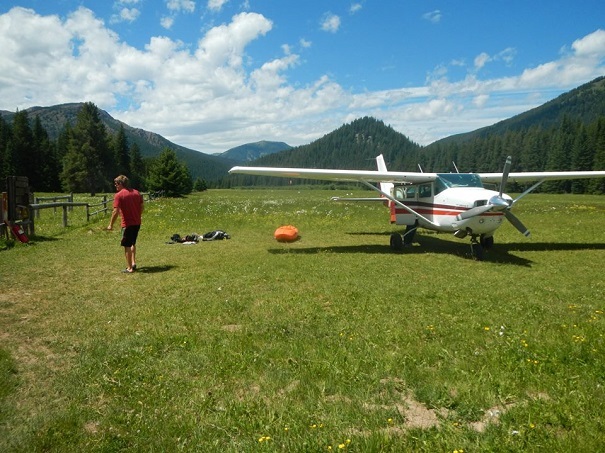 Running the Middle Fork requires flying into Schafer Meadows from the Kalispell city aiport. Red Eagle Aviation (aka Montana Air Adventures) flies a Cessna Turbo Stationair that will carry one kayak and two passengers, or two kayaks and one passenger. The absolute longest boat that will fit is 9'6", which requires removing the door and the passenger seat to load (something the pilot may not always be happy to do). There is about a 1/4 mile carry from the airstrip to the river, which together with the small capacity planes, makes all but the smallest, lightest rafting rigs impracticle. Flights need to be booked for early morning to take advantage of optimal mountain flying conditions. The take out is at Nimrod, where the Middle Fork meets Hiway 2. It is possible to take out lower down at Essex, which has a better boat ramp, but I don't recommend it. From Nimrod to Essex is roadside, and doesn't contain much whitewater. Moreover, its a very anticlimactic way to end the trip after experiencing the Wilderness section of the river. Its 65 miles from Kalispell to Nimrod. Red Eagle offers competitively priced vehicle shuttles. Given the proximity to Glacier National Park, finding accomodations without advanced reservations can be quite challenging. Hotels and campgrounds book up early. Tent camping sites can usually be scrounged at the RV park in Kalispell, and there are also a few private campgrounds between Nimrod and West Glacier that tend to be easier to find space at. There is almost no undeveloped camping in the area. The gauge is located near West Glacier, more than 40 miles downstream from the take out, below several tributaries. As such, its not terribly accurate for this section. The lowest I've run the Middle Fork in a kayak is 4,000 at West Glacier, which equated to extremely low flows that involved dragging over rock bars in the upper section. It would be impossible to get a raft down at these levels. Note that as flows increase, so does difficultly. I don't cite an optimal flow range for this run because I enjoy it all all levels, even extremely low flows. Its not a trip I do for the whitewater, but rather for the solitude. Be weary, as there are a few published sources that provide dubious minimum flow recommendations that could result in a royal skunking on levels. The season starts when flying services begin operating. I've run it as late as the last week of August.